Hi everyone! 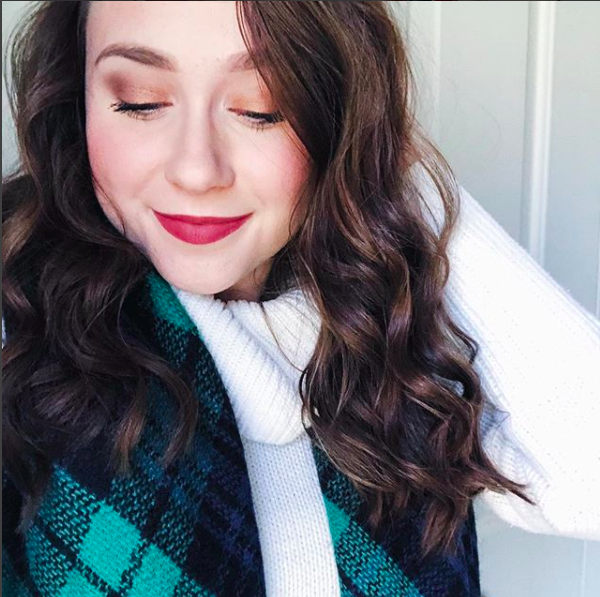 I thought I'd branch off more into the "lifestyle" part of my blog today, as many of my recent posts have been fashion/beauty related. Today's topic: Organization. 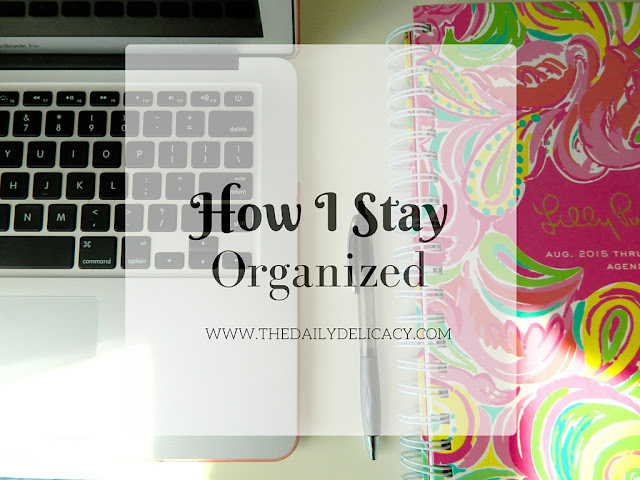 The thought of "getting organized" may seen pretty overwhelming, but I assure you that it gets easier as you get used to it. With so much going on in life right now (work, internships, and blogging) I've had no choice but to get organized. I've always been fairly organized, but recently I've had to get more serious about organization or else nothing will get done on time. I've compiled a list of tips and just little things that I do on a daily basis that help keep me on my toes. Maybe this is obvious, but you'd be surprised how many people actually don't use a planner. I'll be honest, when there's so many different tasks running through your head, some things get pushed to the back of your brain and never get done. Updating your planner doesn't have to be done in a fancy way (although it can be fun to decorate and make it look pretty). Simply writing down any appointments for the day, your work schedule, tasks that need to be completed, etc., is extremely helpful. I love my Lilly Pulitzer Agenda (here's the one I plan on purchasing for the 2016-2017 school year, so cute!) but I've also heard great things about the Kate Spade planners and the Erin Condren planners. Making to-do lists is super helpful in making sure you complete every task that you need to complete. I usually put my to-do lists for the day in my planner, but you can easily just scribble your tasks down on a notepad and call it good if there's no room in your planner. I always star or highlight tasks that are a priority, so I know that those are the things that absolutely must be done today. One of the best parts of creating to-do lists is definitely being able to check things off. I honestly feel like knowing I get to check something off my to-do list makes me actually want to get it done. Use the "reminders" app that comes on the iPhone. This app has probably saved my life a few times. I absolutely love this app, and started using it right after I began college. If you don't use this app, you definitely need to give it a shot. It's basically like a to-do list on your phone, but the app will send you a notification at your chosen time reminding you to complete the task. I always do this with really important tasks, so they'll pop up on my phone if I get distracted or forget about them. You can even slide the notification over and hit "Mark as completed" when you've finished a task. So convenient and extremely helpful! While it's important to create goals for each day, it's also important to create weekly goals. Use a bulletin board or simply post some colorful sticky notes on the wall, each with a specific goal that you like to complete this week. For example, one goal could be "put up an extra blog post" or "come up with 10 blog post ideas". That way, when you continue to see your goal board, these goals will always be in the back of your mind. You can pencil these goals in on specific days as the week progresses or simply complete them when you have free time. Sometimes it's easy to get lost in the day, so creating weekly goals allows you to have something to strive for throughout the week. Labeling has helped me so much, especially in college. This may seem obvious, but creating covers for your binders that say the subject, the time, the professor, and the location is really helpful when you have a hectic schedule. Also, labeling any folders or notebooks is useful as well. You can really label anything you'd like. Labeling makes it easy to find things, therefore helps you to be more organized all the time. One of the best ways to start getting organized is to get into a routine. You should try to get into a daily "rhythm" so you can actually be productive throughout the day. For example, for me, I feel like I'm most productive in the morning. I tend to get distracted as the day goes on, so I try to get a lot of stuff done early. By waking up around the same time each morning, I've established a typical "morning routine", which I look forward to each day. Last but not least, always plan ahead. I try to plan out my days ahead of time so I know what is going to get done when. It really helps space out tasks so everything doesn't pile up at the end of the week. I'll usually add in big events in my planner at least a week ahead, but plan out each individual day in-depth one day in advance. Hope you guys enjoyed my tips for staying organized! What are some of your tips for staying organized? I am so bad at organisation! I never meet my goals and I noticed that I am more productive on days when I don't force myself to sit down and work to meet these goals. Lovely tips, very useful post! That's too funny! It definitely takes a lot of hard work. It'll happen! Great post and great tips! I also use reminders, always! Some good ideas in here! Such great tips, I could always use a few little extra! Thanks so much for sharing! Agendas and to-do lists are my top ways to stay organized!!! Wonderful tips! I'll be using them this school year for sure.